Above is a screen shot of a sweep from 6 to 8MHz. 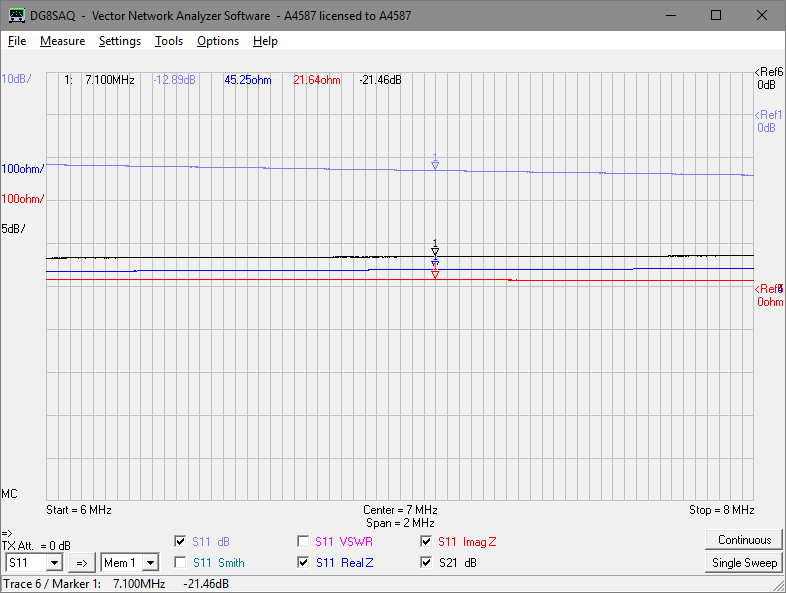 The key data is that shown for the marker at 7.1MHz. 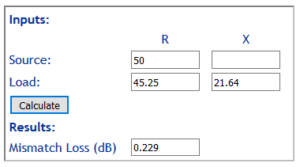 Let us calculate the expected value of |S21|for a lossless transformer, considering only input Mismatch Loss and loss due to division of power between the 3300Ω and 50Ω VNA input. Using the measured input R,X, we can calculate Mismatch Loss at the input. The loss due to input mismatch is 0.229dB. The expected loss due to the division of power between the VNA input and 3300Ω resistor is 10*log((3300+50)/50)=18.26dB. Measured |S21| was -21.46dB, so the additional loss due to the transformer (core and conductor losses), Transmission Loss of the transformer (10*log(PowenIn/PowerOut), is -18.49–21.46=2.97dB. This will be almost entirely core loss. 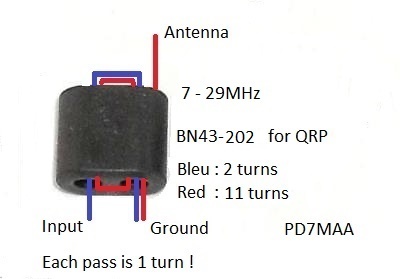 This is close to the estimated core loss of 3.7dB considering that the estimate was based on matched input and considering the tolerance of ferrite components, and variation from transformer to transformer could well be 1dB. The measurements support the estimate which remains the better figure because it is based on average core characteristics rather than measurement of a single core. 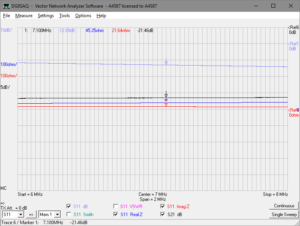 The transformer measurements confirm that the transformer is quite lossy, a feature that the designer does not disclose.